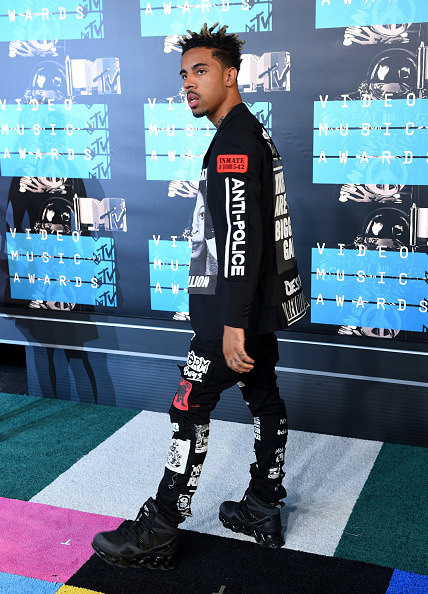 We already knew that Vic Mensa had a problem with the police based on his "U Mad" video, but his VMAs suit takes the issue to another level of awareness. The Chicago rapper is covered in anti-police statements from head to toe, the most notable being the back of his blazer which reads "KKOPS ARE THE BIGGEST GANG." (Reps for Vic Mensa did not immediately return a request for comment.) The front of the ensemble pays tribute to Assata Shakur, an African-American activist and former member of the former Black Panther Party and Black Liberation Army.